We know very little about this society which engineered the positioning of 20 gigantic upright stones, with lintels, which even have brackets carved into them to provide precise joins. 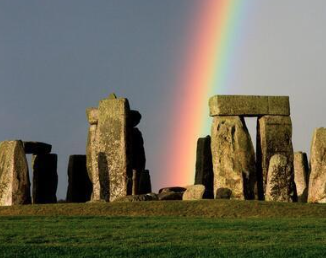 The popularised association of the mysterious site with Druid and other new-world style sects is a relatively recent invention, welling up from romantic imagination, and the yawning space in its history which has not been accessible to real knowledge. We do know that 2,000 years before the ancient Greeks invented Mathematics, a community in this corner of England embarked upon a dazzling project of marking the position of the sun. They could not have known at the outset that it would even succeed, nor how many lives might be lost in its construction; nor how many generations would contribute to its building. But the stones do speak to us very plainly across several millennia: the accomplishment of this phenomenally precise ambition demonstrates a mind-blowing grasp of Geometry. People will have prepared for the task following previous generations of accurately recorded data accumulated by sharing their observations of the skies. Their wonderment at The Inexplicable was matched by an interactive engagement with it, using all that their enquiring senses could gather up and inventively order. Evidently, starting from the security of a basic family model, mankind has needed to shore up the strength of his prosperity on this earth by building onto those simple primary childhood blocks. He has added allies, and their different perspectives, in order to survive and to progress. Man never evolved into the complex thinking machine (which now embraces artificial intelligence) by obeying any natural law of plain simplicity. By complicating his life in order to grow economic societies, he has harnessed chaos itself to thrust open the doors to vistas of his uttermost potential. In order to travel safely along that perilous road to self- fulfilment he needed to become part of a gang, or even a gang within a gang, tenuously linked to other gangs. This fluid chemistry of wilfulness, marking dream upon dream, is what is recognisable as human culture. But human evolution has been not only a focussed and random Darwinian raid on resources, a mapping out of survival. It has had the added dimension, scientifically unquantifiable, of being one long story of identity crisis. Slaves or masters of their own dynamism, human gangs provide both cradles and vehicles for a planet’s history.